Animal Costumes Blog: New kigurumis - movie stars! New kigurumis - movie stars! 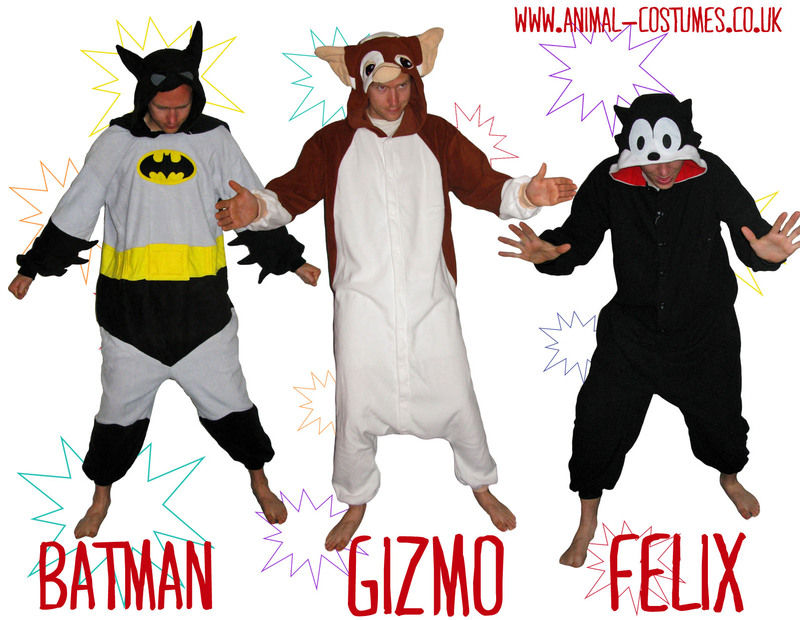 We have just finished working on the launch of a new range of kigurumi animal costumes. These guys are officially licensed movie stars, and they are seriously cool. They are a bit more pricey than the animal kigurumis, but it's really reflected in their awesomeness (we hope you agree!). Gizmo is the adorable mogwai creature from the Gremlins movies. Possibly the cutest thing to ever come out of Hollywood, he is a little furball of joy and we love him. A word of caution though, if you feed him after midnight all hell will break lose and you will find yourself overrun with nasty little green gremlins. Unfortunately Animal Costumes Shop can accept no liability in the event that you decide to eat a post-midnight snack whilst wearing this kigurumi. Buy the Gizmo kigurumi here. Batman is not really an animal. Unless you count humans as animals, which really you should because they are. Animal or not, the caped crusader is super dooper enough to make it into the Animal Costumes Shop line up any day of the year. This kigurumi is easily one of our faves, with a detachable cape and a zip up back (as opposed to the usual button-up front). Endearing butler not included. Buy the Batman kigurumi here. Felix the Cat is a cartoon character that first appeared on screens in the 1920s. He has been through various incarnations but his iconic big white eyes have always been unmistakable. His adventures are among the more ludicrous and surreal of the cartoon world. What will you get up to? Buy the Felix the Cat kigurumi here.